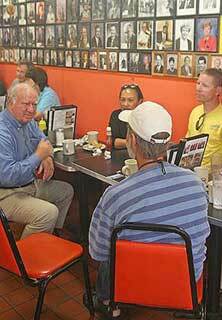 Breakfast at Chick & Ruths Delly in Annapolis. As I photographed the early morning light illuminating cobblestones on Main Street in the “sailing capitol of the world,” a bay breeze wafted food smells through the moist air. In search of breakfast, I passed a sign that advertised a Ghosts of Annapolis Pub Crawl. Seeking a less spectral breakfast, I entered Chick and Ruths Delly. It was 8:29 a.m. As the clock struck the half hour, the business and tourist crowd stood up from their seats and faced the flag in the corner. Prompted by restaurant manager Ted Levitt, everyone recited the Pledge of Allegiance, a long-standing daily tradition at the restaurant. I ordered an “Ellen Moyer.” The sandwich, cream cheese and olives on toast for $2.50, was named for Mayor Ellen O. Moyer, a family friend of the restaurant’s owners Ted and Beth Levitt. Moyer was the first woman in the town’s 300-year history to become its mayor. Moyer, in 2007, welcomed the Middle East Peace Conference to “Naptown.” It was attended by the Israeli Prime Minister, Palestinian President, American President, and Saudi Arabian officials. A regular customer next to me at breakfast observed that the distinct taste of the olive-laden breakfast sandwich far outlasted any olive branch of peace prompted by the conference. 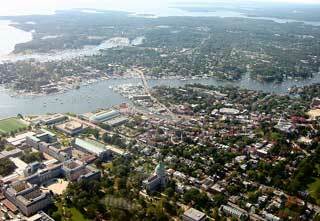 Aerial of Naval Academy and City of Annapolis, used by permission of photographer and pilot Mike Fitzpatrick at http://flickr.com/people/piedmont_fossil. 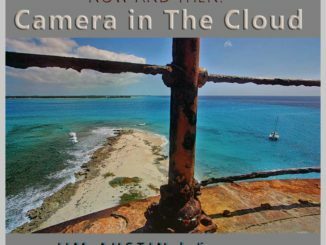 Having sailed into Annapolis with a wooden tiller in one hand and a digital camera in the other, I chose to depict its two different sides. 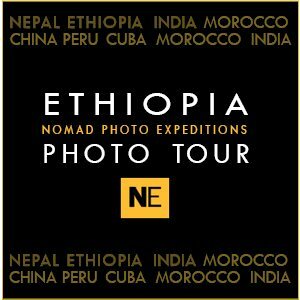 First, I made exposures of the town, and later, I took snaps of the U.S. Naval Academy. William Eddis, a 1769 town resident, noted that Annapolis commanded a “variety of views highly interesting; the entrance to the Severn, the majestic Chesapeake, and the eastern shore of Maryland, being all united in one resplendant assemblage. Vessels of various sizes and figures are continually floating before the eye.” Today the beauty of Annapolis still floats before the eye, inviting one to walk its side streets in search of historical scenes and figures. Bronze statue of Thurgood Marshall. Marshall, the first African-American appointee to the Supreme Court, was honored by an 8 foot statue depicting him as a young lawyer. 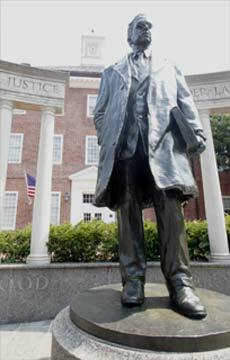 His statue stands on the exact spot in Annapolis where Marshall polished key arguments for the landmark civil rights case Brown vs. Board of Education. Having admired Marshall’s progress on civil rights, it was thrilling to see and photograph his memorial, as it was a fitting tribute to a cooperative spirit that built Annapolis. Marshall once said, “None of us got where we are solely by pulling ourselves up by our bootstraps. 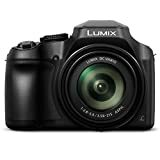 We got here because somebody–a parent, a teacher, an Ivy League crony or a few nuns–bent down and helped us pick up our boots.” I pointed my boots towards the waterfront. The Compass Rose at the waterfront. It was a quick ramble down Main Street to the harbor. 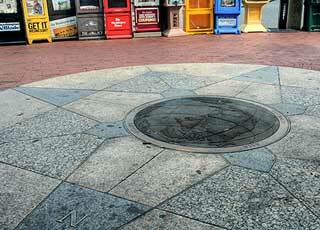 At water’s edge by the city dock, colorful newpaper vending machines lined the brick walk next to a granite and bronze compass rose. 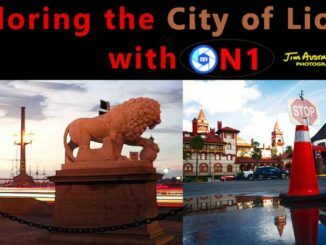 The compass showed a world map with Annapolis at its center, and celebrated the arrival of Kunta Kinte to the spot on September 29, 1767. Students at St. John’s College. As I strolled across town toward the Naval Academy, I passed a group of guys who wore T-shirts that advertised Dutch and German beer gardens. They were students at St. John’s college known as “Johnnies.” Their college, famous for its Great Books program shares borders and history with the Naval Academy. The two schools were age-old rivals. At times this rivalry between the Johnnies and the USNA midshipmen, “mids”, was intense. When the mids marched to their football stadium for a game, Johnnies stole their white Navy caps. The mids quickly adapted, and learned to open a gap in their ranks. Unsuspecting Johnnie’s were lured in, and then captured when the mids closed ranks. On some occasions, a college student was held captive inside a Navy group, and marched all the way to the stadium before being released at midfield at the start of a Navy football game. Crossing a narrow street, I arrived at the Naval Academy, and saw the Chapel ahead. The USNA security guard cleared me past the west gate. 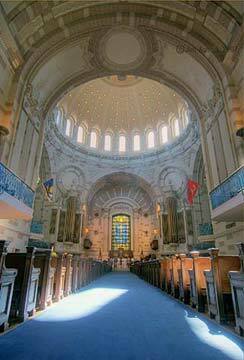 I mounted the camera on a home-made tripod and entered the Naval Academy Chapel. Accompanied by the chapel organ, a group of Navy midshipmen sang lines from The Phantom of the Opera as they tried out for a campus production. 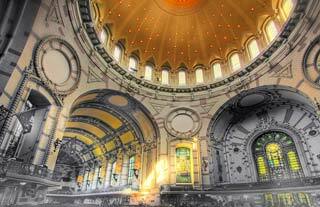 Their voices punctuated the shafts of diffused sunlight that illuminated gold-leafed details within the huge dome. Another Navy hero who never gave up the fight was Admiral John A. Dahlgren, the father of modern naval ordnance. The building that bears his name has shells of two WWII-era submarine torpedos in front of it. Side-stepping the torpedos, I walked inside. 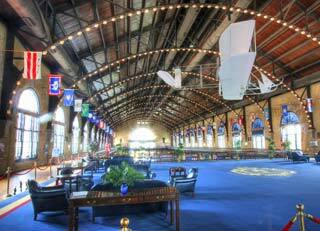 Built in 1909 to feed 1800 midshipmen, Dahlgren Hall holds an ice rink and restaurant. It looked like an airplane hanger built around a gym, done in Beaux-Arts architectural style. Second floor view of the Dahlgren Building at the Naval Academy. Overhead, the white shape of a small airplane graced the ceiling. The airplane was a reproduction of the B-1 flyer, the first Naval airplane, assembled inside of Dahlgren Hall after the Wright Brothers won the commission to produce it. With determination and a fighting spirit, Lieutenant John Rodgers flew the B-1 for 15 minutes on September 7, 1911, taking off from a field next to Dahlgren Hall. Later that same day he flew the B-1 to Washington D.C.
As I left Annapolis, I reflected on the ways that its residents have embodied all these values: the faith of the early Maryland colonists, the courage of Thurgood Marshall, and the service of Navy officers. Today, people of Annapolis keep their faith and honor by pledging allegiance each morning in Annapolis at Chick and Ruths Delly. 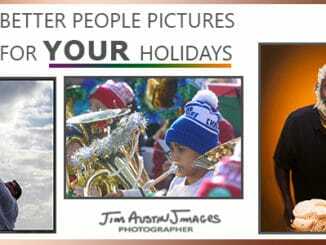 by Jim Austin, M.A., A.C.E.